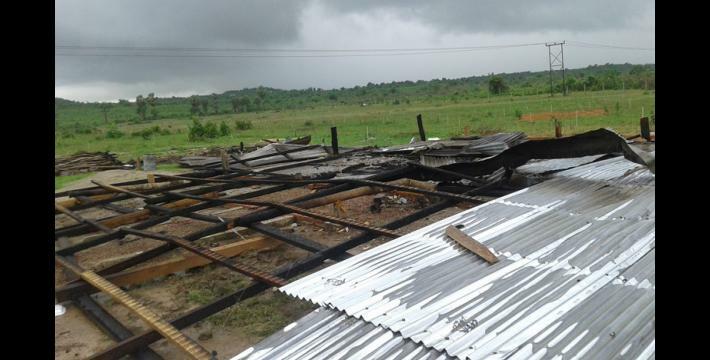 This News Bulletin describes an incident in which the Burma/Myanmar government police force and Burma/Myanmar Department of Forest Management destroyed and burnt down 97 villager houses, displacing approximately 500 villagers in B--- village, Hpa-an Township, Thaton District in June 2015. 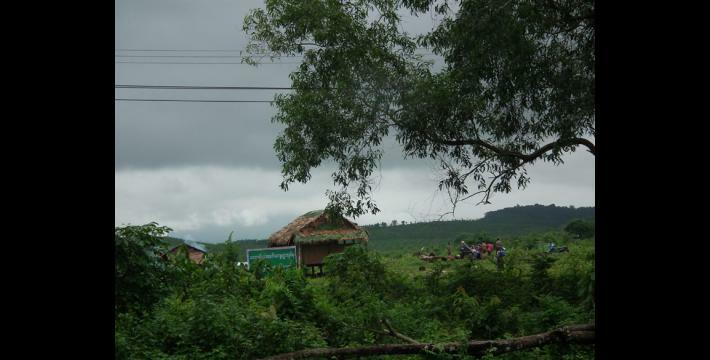 Despite holding Karen National Union (KNU) issued land grants, villagers were ordered by the Burma/Myanmar government to move out of their village since the government demarcated the area as a forest reserve. 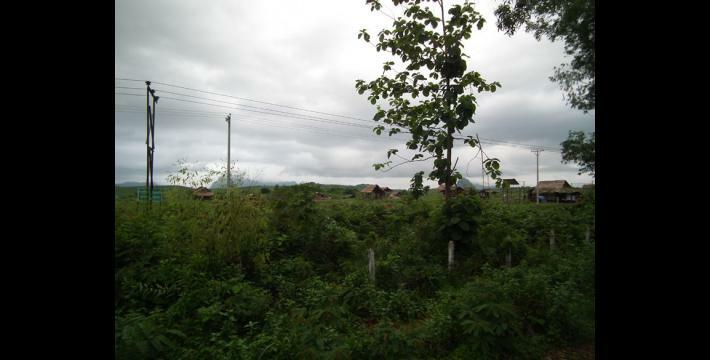 However, villagers reported that this land was the location of their old village, which they had to leave behind in 1983 during altercations between the Tatmadaw and the Karen National Liberation Army (KNLA). The villagers also noted that even though the government demarcated the land as a forest reserve, there are no big teak or ironwood trees there. 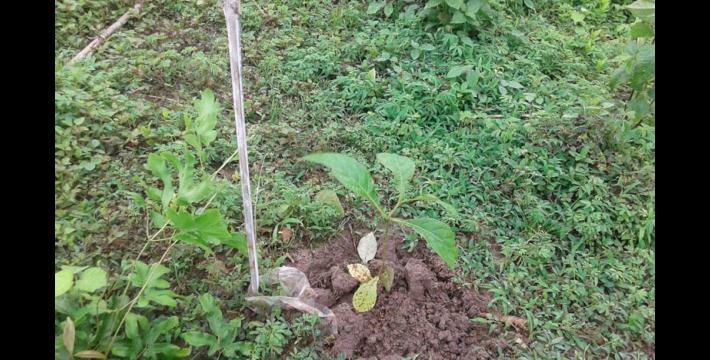 In addition, businessmen from Hpa-an Town came and planted rubber trees and the Tatmadaw sometimes use the area for target practice. 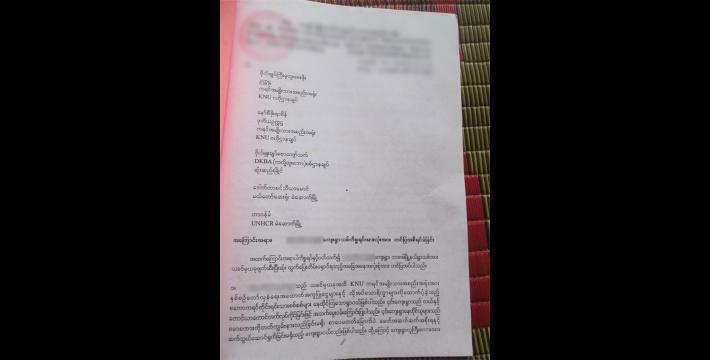 The Chief Minister of Kayin State, U Zaw Min, threatened villagers into signing a document stating they agree to dismantle their houses and would not live on that land anymore. 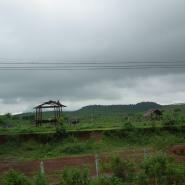 In attempting to prevent the destruction of their village, villagers sought help from Saw P---, who attempted to advocate on their behalf, to no avail. 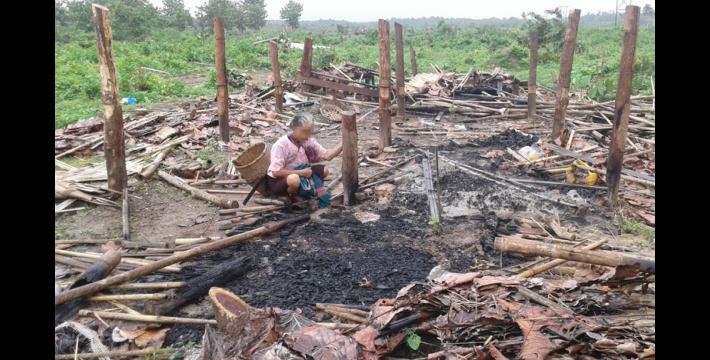 When the villagers refused to dismantle their village, the Burma/Myanmar government police arrested 25 villagers, one monk and one KNU/KNLA-Peace Council (KNU/KNLA-PC) member and continued to raid the village, burning and looting villagers’ houses, and planting teak trees. 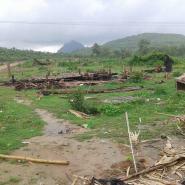 In the aftermath of the raid, approximately 100 villagers fled to Myawaddy with the help of Saw P---, since they do not dare to live in the village any longer. A KHRG researcher also interviewed one of the fleeing villagers and a full interview can be found here. 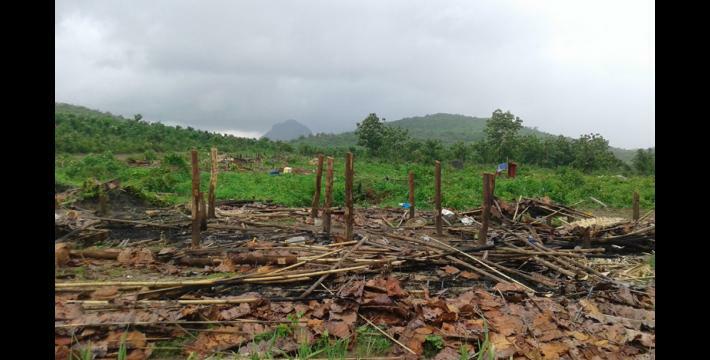 For an in-depth analysis of recent trends in land confiscation in southeast Burma/Myanmar see KHRG’s latest thematic report, “’With only our voices, what can we do?’: Land confiscation and local response in southeast Myanmar. 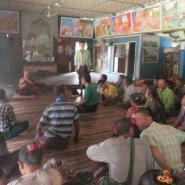 On July 5th and 6th 2015, members of Karen Human Rights Group (KHRG), Karen Environmental and Social Action Network (KESAN) and Karen Women Organisation (KWO) met with the villagers from B--- village, Hpa-an Township, Thaton District whose houses were destroyed and burnt down by the Burma/Myanmar government police force from Myaing Ka Lay Town between June 22nd and June 25th 2015. 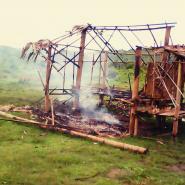 The villagers recounted in detail how the incident unfolded and the strategies they used. D--- village is located on both sides of the main vehicle road from Hpa-an Town to Yangon, in Kaw Yin A Htet village tract, Hpa-an Township, Thaton District. 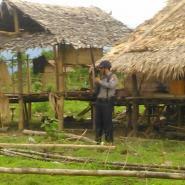 The village is a Karen village in which villagers mostly earn their livelihoods from subsistence farming. D--- village is divided into two parts, B--- and C---. B--- is the upper, or eastern part of D--- village, while C--- is the lower, or western part of the same village. The two parts are separated by the vehicle road. 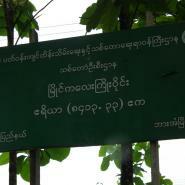 B--- is a disputed territory, as it has been designated as a forest reserve by the Burma/Myanmar government despite villagers proclaiming it as their inherited land and place of residence. The history of the dispute can be traced back to October 1983, when Commander Myint Thein from Karen National Liberation Army (KNLA) Brigade #1 (Thaton District) passed through B--- area and kidnapped a French couple. 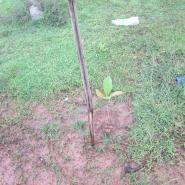 The husband was an engineer who came to build a cement factory in Myaing Ka Lay Town. Commander Myint Thein took them to Manerplaw, Hpa-an District, where the headquarters of the Karen National Union (KNU) was located. 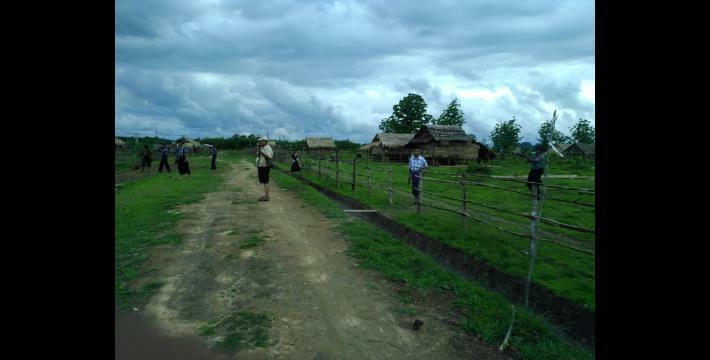 The villagers did not dare stay in their houses along this road for fear of a Tatmadaw retaliation to the kidnapping and decided to move far from the vehicle road to C--- village. 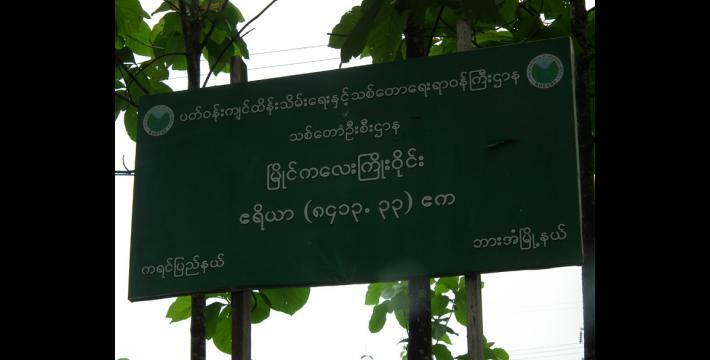 Since then, the Burma/Myanmar government confiscated the land on which B--- village stood, demarcating it as Myaing Ka Lay Forest Reserve. Even though the government demarcated the village area as a forest reserve, there are in fact no teak or ironwood trees in the area. 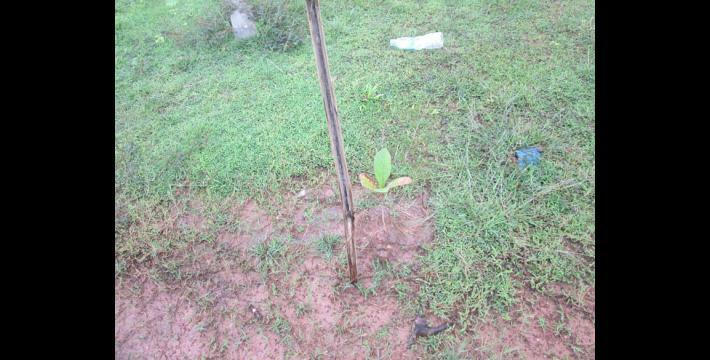 Moreover, wealthy individuals from Hpa-an Town colluded with people of authority from the Burma/Myanmar government Department of Forest Management and planted rubber trees for commercial purposes in the area. 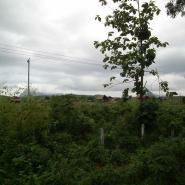 The elite businessmen have a vested interest in this land as it is close to the main road. 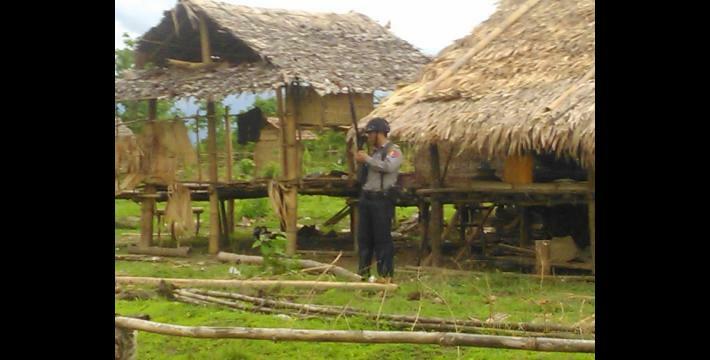 In addition, the Tatmadaw has also been using the area as a firing range for target practice. 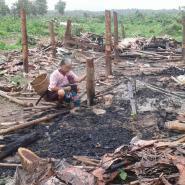 As a result of these actions by the Burma/Myanmar government and wealthy individuals, the area available for villagers’ livelihoods became much smaller. 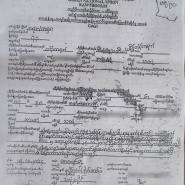 Following the 2012 ceasefire, the B--- villagers submitted application forms to the Burma/Myanmar government of Kayin State in order to obtain land titles to be able to stay and work on their lands in B--- village, but received no reply. 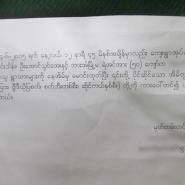 They also submitted an application specifically addressed to the chief minister of Kayin State, U Zaw Min, and to the KNU. 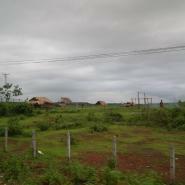 The price of the land in the area began rising after 2010, as the military government was replaced by a semi-civilian government, which opened up the area for business and development. The villagers submitted their applications as soon as the political situation enabled them, since they knew wealthy individuals would continue to buy the land from under them. The Burma/Myanmar government officials told the villagers that they would work on their behalf to get their land back, but no progress was made in addressing the B--- villagers’ specific request. Meanwhile, the Burma/Myanmar government did provide an opportunity for any landless people in Kaw Yin A Htet village tract to obtain land grants. 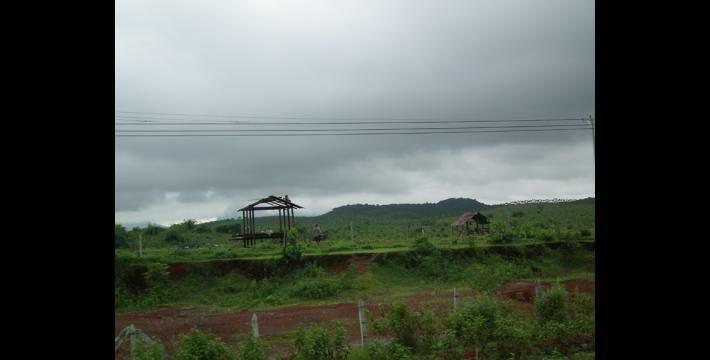 The Burma/Myanmar government set aside 20.8 acres of land in Shwe Ni area in Kaw Yin A Htet village tract, Hpa-an Township and allowed any landless people in the village tract, including B--- villagers, to enter a draw to obtain plots of land there. 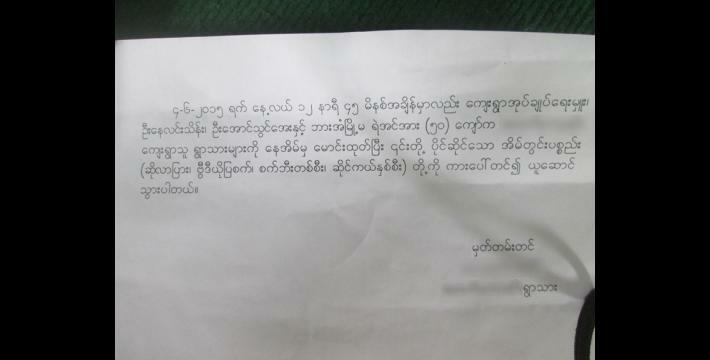 However, the area offered by the government in Shwe Ni was far away from the B--- villagers’ place of residence and was not the land that the B--- villagers were asking for, so none of the B--- villagers took the offer. When they realised the Burma/Myanmar government was unwilling to grant the B--- land to them, the village head and the farm owners requested the KNU to come and demarcate the land, instead. 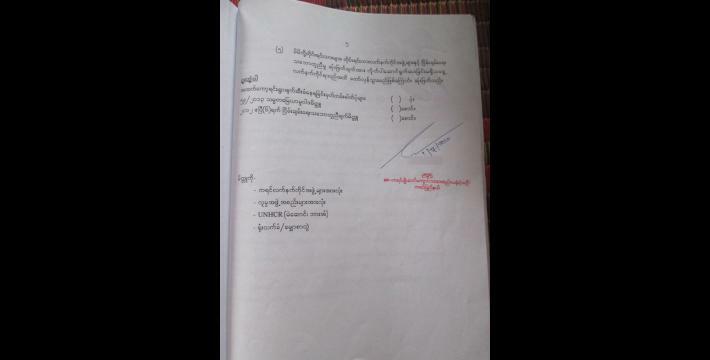 Therefore, the Agriculture Department of the KNU measured the land and provided the land titles to the villagers on October 18th 2014. 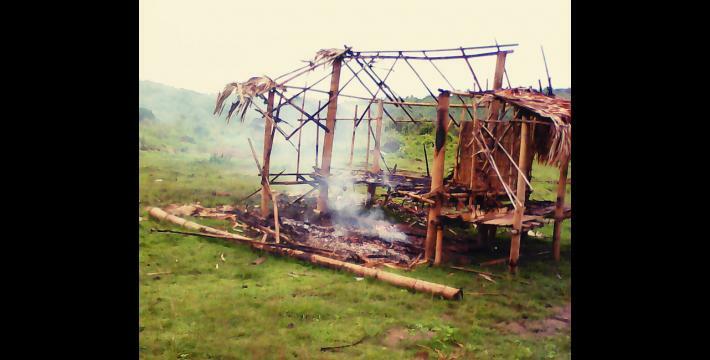 Following the demarcation of the land by the KNU, the villagers from B--- village went to the area and with the leadership of the senior monk of E--- monastery, Monk G---, cut down the rubber trees that had been planted by the wealthy individuals on their lands. 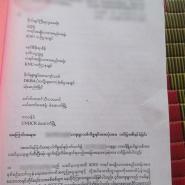 Consequently, they were accused of violating Article #40 (a) of the 1992 Forest Law and each villager had to pay 10,000 kyat (US $8.59) as a fine to the police. 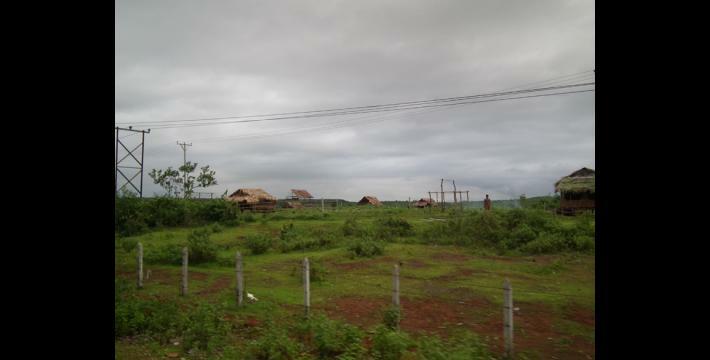 In January 2015, villagers went back to the area and started to build houses and live in the area. On February 1st 2015, U Zaw Min, the chief minister of Kayin State, summoned 15 of these villagers to his office and ordered them to sign an agreement stating that the villagers will dismantle the houses by June 22nd 2015 and will not live on that land anymore. 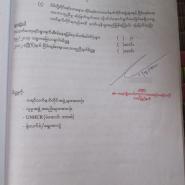 According to the villagers who were summoned by U Zaw Min, “He looked very aggressive and he punched the table repeatedly when he was speaking.” The villagers told a KHRG member that they did not want to sign the agreement, but U Zaw Min threatened to put the villagers in jail, therefore they had no choice but to sign the document. 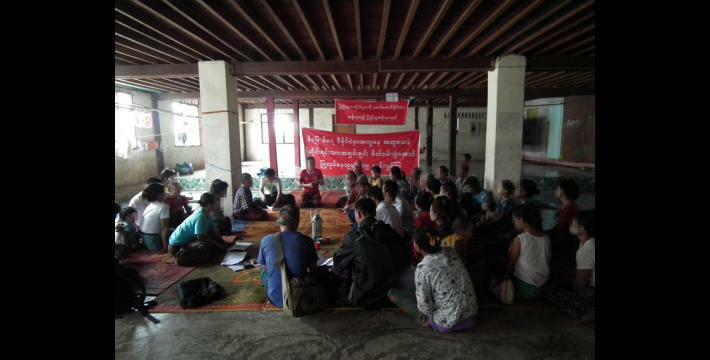 When the KHRG member met with the villagers, villagers reported that the police came and arrested 24 villagers on June 2nd 2015 and detained them in jails in Taung Ka Lay and Hpa-an towns. 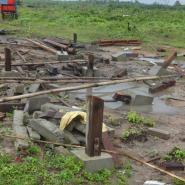 The police accused the villagers of encroachment. 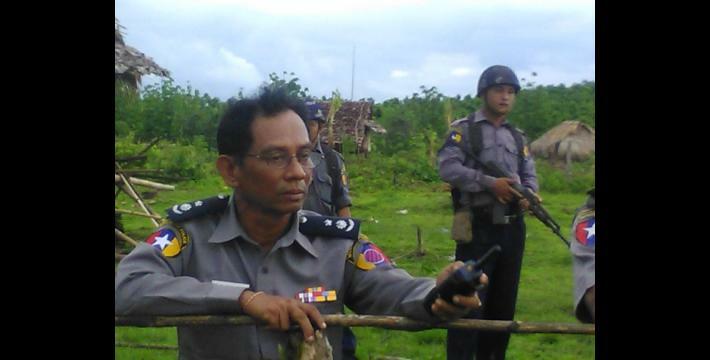 On June 22nd 2015, a large number of police officers and authorities from the Department of Forest Managment of the Burma/Myanmar government came into the village and dismantled the houses. They destroyed the houses with chainsaws and burnt down the houses of villagers, including a school that the villagers had built on their own. 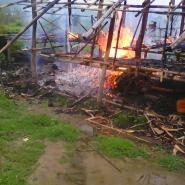 The police also arrested three villagers on that day, totalling 27 people in the course of the raids on B--- village. 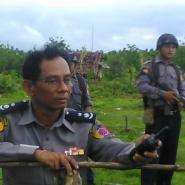 Among those arrested was Saw Michael, the Deputy Commander of KNU/KNLA-PC Battalion #776, and a monk. 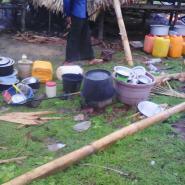 There are some villagers who are still wanted by the police but they have so far successfully evaded arrest. 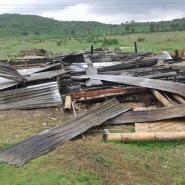 The police and Department of Forest Management representatives came again on June 23rd, 24th and 25th 2015, destroying and burning down houses. 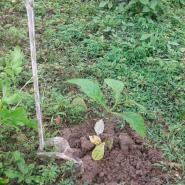 Some of them planted teak trees while the others continued destroying and burning the remaining houses. 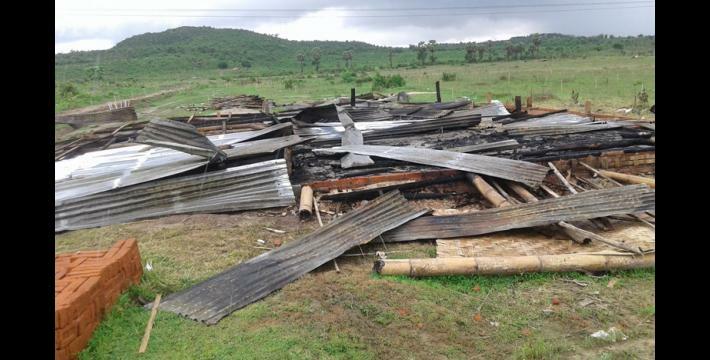 According to the villagers, 97 houses were destroyed by the police in addition to another 78 houses that were dismantled by villagers themselves prior to the June 21st deadline given to them. 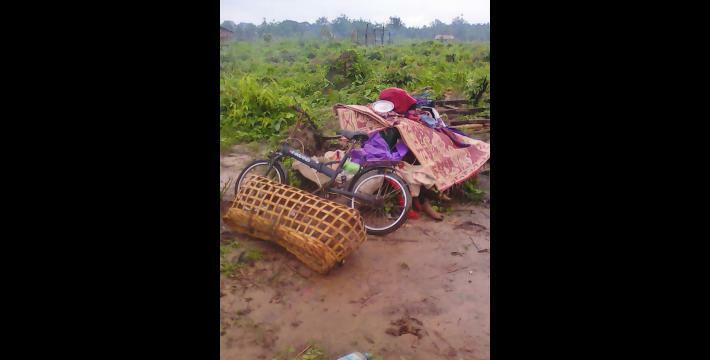 As a result of these events over 500 people were displaced. Some villagers ran into the jungle and some villagers went back to C--- village. 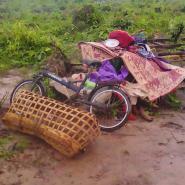 The police also took two motorbikes, one solar panel, two batteries, two TVs and two grass cutters that belonged to the B--- villagers, in addition to taking 900,000 kyat (US $771.21) from B--- villager U H---’s house for themselves. 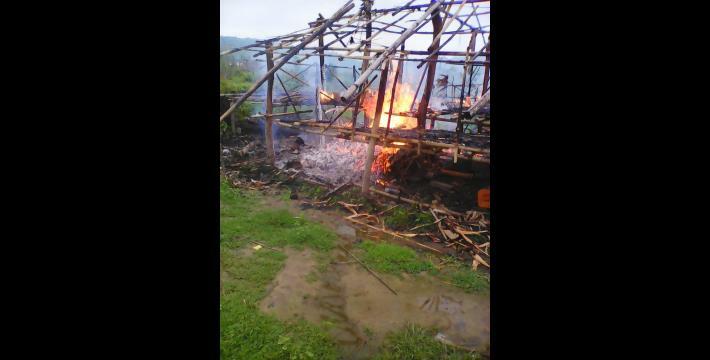 Within four days, the police had dismantled and burnt down all the houses in B---. They had previously ordered the villagers to dismantle their own houses prior to June 22nd 2015, before they came and destroyed them themselves. 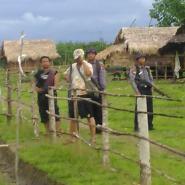 Only a few villagers obeyed the order and dismantled their houses prior to the arrival of the police in the village, but most villagers did not. 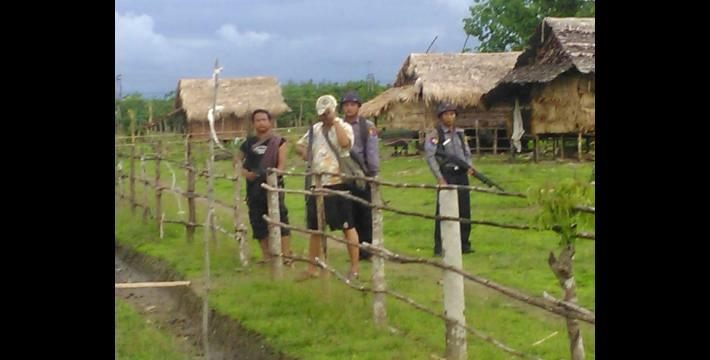 Over 30 households, amounting to approximately 100 villagers, fled to Myawaddy with the help of Saw P---, since they do not dare to live in the village anymore, and they are afraid that the police could come and arrest them at any moment. 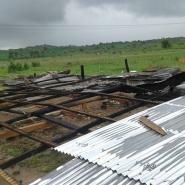 On July 6th 2015, a group of KNU delegates from Hpa-an Township, Thaton District and some delegates from the KNU headquarters visited the place where the houses were burnt down by the police. 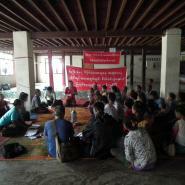 They also had a meeting with the villagers and village administrator in C--- monastery, in C--- village. Only a few villagers came to the meeting and they said that the other villagers did not dare to come to the meeting as the village administrator did not invite them to the meeting. Some of them said they were afraid that the village administrator would inform the police about their participation after the KNU delegates left. 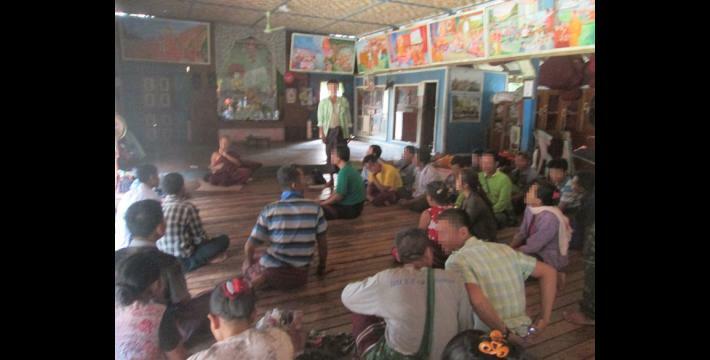 The delegates from the KNU attempted to mediate between the villagers and the village administrator by pushing them to speak with each other and address the problem at hand. During the meeting, a villager said that Yay Khe, a wealthy man from Hpa-an Township came to her house and told her that he gave a two million kyat (US $1,713.80) bribe to the village administrator and one million kyat (US $856.90) in bribe money to a village leader named Saw K---, who has a close relationship with the village administrator to help him to get access to 30 acres of land for planting rubber trees. Yay Khe also said that Saw K--- has returned the one million kyat (US $856.90) to him but the village administrator has not given him any of the money back as of yet. Moreover, when one of the villagers asked the village administrator whether he took the money or not, the village administrator did not give him a straight answer. All he said was that Yay Khe asked him to sign a paper declaring the land to be wilderness instead of farmland, thus belonging to no one. 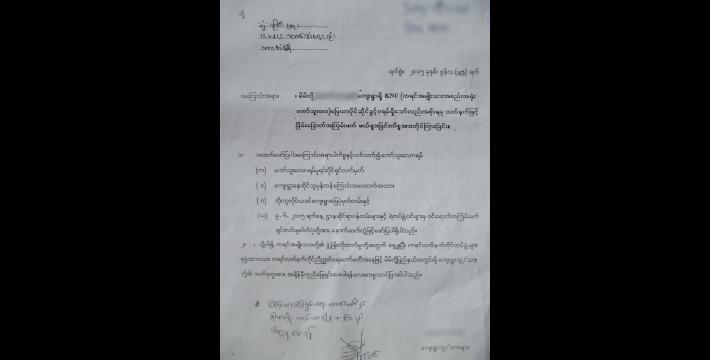 This paper, which the village administrator signed, was necessary for Yay Khe to get permission from the government to work on that land. 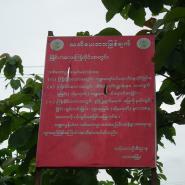 Prior to the incident with the police and Department of Forest Management, it was the generally accepted opinion among the villagers that if wealthy individuals and companies from different places were allowed to grow rubber trees in the “forest reserve,” then the villagers should be allowed to stay there, as well, and live on their own land. 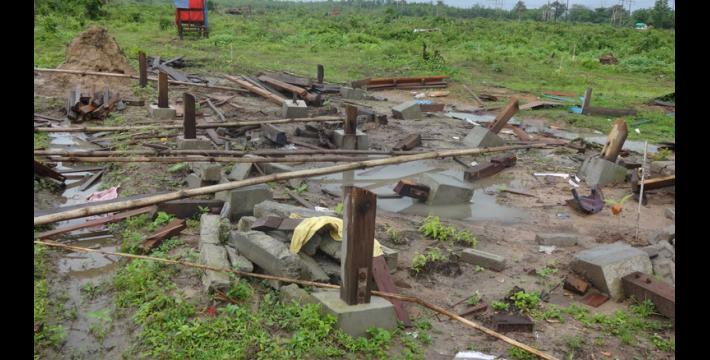 Therefore the villagers gathered together and built houses on the land, but the Burma/Myanmar government did not care about the villagers’ plight and destroyed all the houses that they had built. 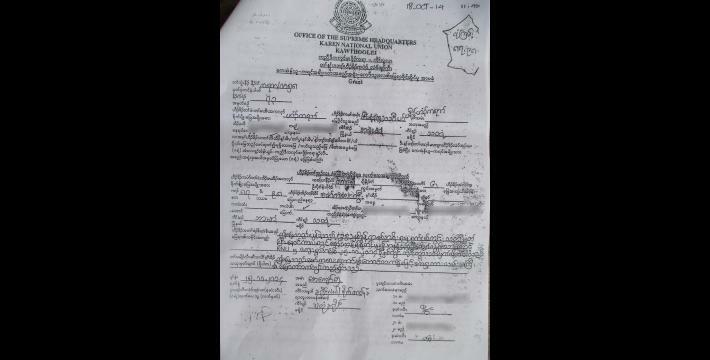 The Burma/Myanmar government release those who are in the Hpa-an and Taung Ka Lay jails. 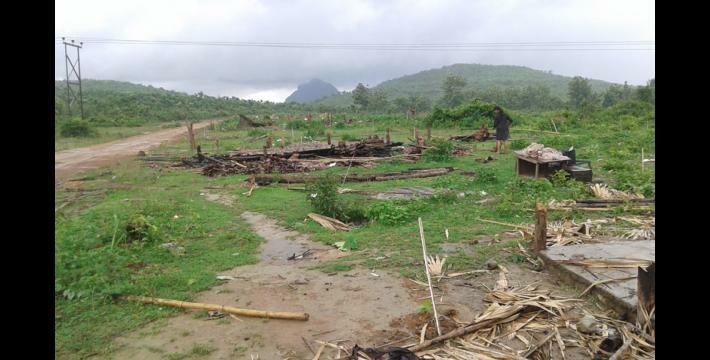 The government allow the people who ran to Myawaddy to come back freely, without arresting any of them, as well as pay the villagers for the things that they have destroyed and stolen. 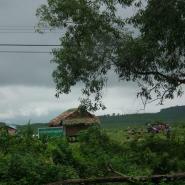 The KNU help villagers get back their land. 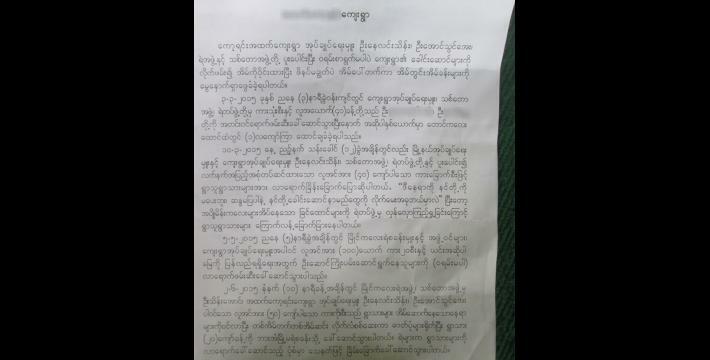 Finally, the KHRG member who has received this account from the villagers expressed his opinion on the matter, noting that the Burma/Myanmar government confiscated many villagers’ lands in Kayin state in the past, and villagers tried their best to get their land back after the preliminary ceasefire talks between the Burma/Myanmar government and the KNU. 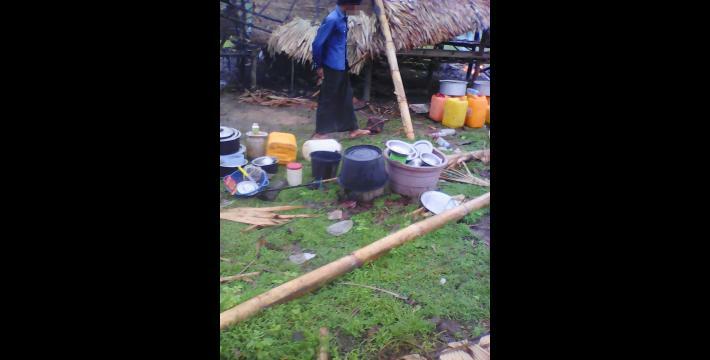 However, the Burma/Myanmar government did not solve the villagers’ land problem. The villagers are only asking for the land that they had inherited from their ancestors. The government must address the land issue for the villagers immediately. This News Bulletin was written by KHRG office staff and is based on information from a community member who has been trained by KHRG to monitor local human rights conditions. In order to increase the transparency of KHRG methodology and more directly communicate the experiences and perspectives of villagers in southeast Burma/Myanmar, KHRG aims to make all field information received available on the KHRG website once it has been processed and translated, subject only to security considerations. For additional reports categorised by Type, Issue, Location and Year, please see the Related Readings component following each report on KHRG’s website. 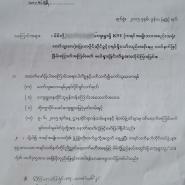 On January 12th 2012, a preliminary ceasefire agreement was signed between the KNU and Burma/Myanmar government in Hpa-an. Negotiations for a longer-term peace plan are still under way. For updates on the peace process, see the KNU Stakeholder webpage on the Myanmar Peace Monitor website. For KHRG's analysis of changes in human rights conditions since the ceasefire, see Truce or Transition? Trends in human rights abuse and local response since the 2012 ceasefire, KHRG, May 2014. In March 2015, the seventh round of the negotiations for a national ceasefire between the Burma/Myanmar government and various ethnic armed actors have begun in Yangon, see “Seventh Round of Nationwide Ceasefire Negotiations,” Karen National Union Headquarters, March 18th 2015. 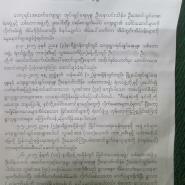 Following the negotiations, the KNU held a central standing committee emergency, see “KNU: Emergency Meeting Called To Discuss Nationwide Ceasefire Agreement And Ethnic Leaders’ Summit,” Karen News, April 22nd 2015. 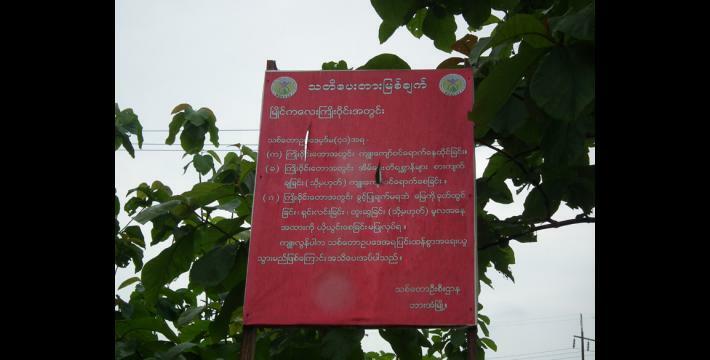 Article 40 of the 1992 Forest Law, which governs forest reserves states, “Whoever commits any of the following acts shall, on conviction be punished with a fine which may extend to 5,000 kyat (US $4.30) or with imprisonment for a term which may extend to 6 months or with both.” Article 40 (a) lists the act of “trespassing and encroaching in a reserved forest.” Although this law states that they may be fined up to 5,000 kyat (US $4.30), villagers were charged twice the amount, presumably because their only source of information on the law comes from a sign that was put up in the forest reserve, which omits the lawfully permitted punishment. All conversion estimates for the kyat in this report are based on the August 3rd 2015 official market rate of 1,167.00 kyat to the US $1. 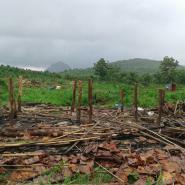 For a KHRG analysis of trends in land confiscation in southeast Myanmar between 2012-2014, see “‘With only our voices, what can we do?’: Land confiscation and local response in southeast Myanmar,” KHRG, June 2015.